Ron Langford has been studying and playing the piano for over 20 years. He has studied the classical era, modern classical (contemporary) and alternative forms of classical piano artistry. He has had a wide range of instruction from blues, rock, classical - to new age, alternative, and progressive. He went to college as a piano major but ended up with a B.A. in Psychology and a M.S. in Special Education. Currently, Ron works as a 7-8th grade SDC teacher in California. He plays in recitals and holds concerts around California. Ron Langford tends to write new music but will carry a few favorites within his repertoire. He is currently working on a second album of classical, solo piano pieces in Nevada City, California. KeyDragon is a project created by Ron Langford to incorporate new styles of music into the "Heavy" sound of metal. Ron Langford, otherwise known as KeyDragon, has assembled a group of musicians ranging from speed and death metal to rock 'n' roll, to blues and classical music. The music is very diversified but maintains a heavy sound throughout. 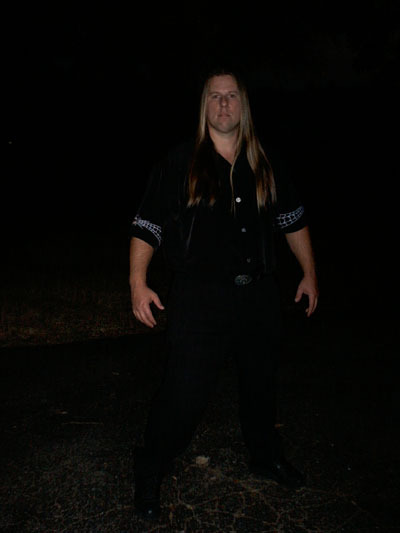 KeyDragon has been influenced over the years by: Bad Brains, The Exploited, Adolescents, Leaves Eyes, Darkwell, Trail of Tears, Pantera, Obituary, The Plasmatics, Bad Brains, Motley Crue, Metalica, Devo, Fear Factory, Cannibal Corpse, Chimaira, NIN, Linkin Park, Dimmu Borgir, Emperor, Lacuna Coil, Otep and other innovative, heavy sounding projects. If you like new, innovative, and heavy music, then this is the band for you! KeyDragon is a Gothic/Power/Doom Metal band with unique songs that combine an aggressive singing/screaming vocalist with a heavy synth player, a keyboarder of the new wave type, A rock 'n' roll drummer/percussive synthesist, three different guitarists ranging from death to new wave, and a troupe of 3 tribal, Gothic female vocalists. When these powers combine, the most original, heavy, and driven music is created. George R Langford has provided much of the inspiration as well as the theme of the second album - Drink From The Waters Of War. Three songs are of the war as it really is and does...not the war you see and hear about from everyone else. Ron Langford (KeyDragon) has written 5 songs of a fantasy war of Dragons. This is one of the heaviest experiences you will ever undertake. Be prepared to Drink From The Waters Of War! KeyDragon has finally finished their third album - Fire Red Perception - and it was released on Halloween, October 31, 2004. KeyDragon is finished up on their fourth album - Uncontrollable Forces - and a CD release party occurred on October 29th, from 8pm to Midnight at the Marysville Elks Lodge in Northern California. KeyDragon has a new line-up for their 5th album - Dragon Prophecy - which is now available! The angelic Tamara Venus Star fronts this album with beautiful vocals. The new line-up for KeyDragon is working out well and will remain intact for their 6th album. These guys & girl have been in the scene for a little while now. They play a combination of Rock Metal & Fantasy all mixed together. Most of their music is based on Dragon Mythology &stuff related to Dragons. This is where the Fantasy type atmosphere comes into play. They have a Classic Rock sound with tinges of Metal all through out. At times there are some almost Death Metal like parts, especially in the vocals. There is a mixture of Male & Female vocals as well. I have heard their past releases & would have to say this is thier best release to date. If your into Fantasy Rock & Metal with a World vibe then you'll dig this band a lot. 9th Wave is a new wave band formed by Ron Langford that has been around for nearly two decades. It has seen dozens of members and many stages. The emphasis of this band was always to provide original and unique synthetic music. Two keyboard players insures that it has a key-driven sound. This band has recently reformed as - DontWalk - and will be on the scene with live music...soon! Dry Rot is a collective of 4 heavy metal artists. Ron Langford put this band together from musicians he played with in other metal bands. Ron Langford has played with Execution in Missouri, Juggernaut, Corrupted Filth and Decreation from Nevada City, CA. He is a Death metal vocalist/keyboardist with classical training and uses heavy bass sounds and samples in his keyboarding.